These paddles are the original high quality German or British made split paddles produced during the 1950's - 70's. Some of the paddles are renowned for being lightweight, even lighter than the paddles currently being produced. 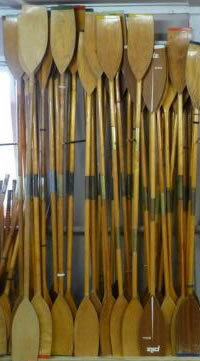 These paddles are 'used' - sold here to complete or replace your existing collection, hence condition will vary. Detailed photos available on request. Any particular old paddle not listed here, do provide details and we will try get one for you.